Now that Killian is a toddler he sleeps with a blanket and stuffed animals. Medical experts highly recommend that babies have nothing with them in their cribs. One of the topics I am often asked about is how to get your kids to sleep. Our children’s sleep is not only important to them because it is crucial to their overall health, growth and development but also paramount for us parents. If your child is not sleeping well, neither are you. Adults need sleep as much as our babies do and when our kids are not getting enough, everyone suffers. My son is a great sleeper. By six months old , after a few setbacks and revised strategies, copious research and expert advice, Killian was napping twice a day and sleeping 11 to 12 hours straight through the night. At 21 months old, he now naps once a day for about three hours and continues to sleep around 11 hours without waking at night. I often wonder about nature vs. nurture. Does Killian’s chill personality contribute to his restful sleep? Probably. But I also know that my husband and I have something to do with it, too. 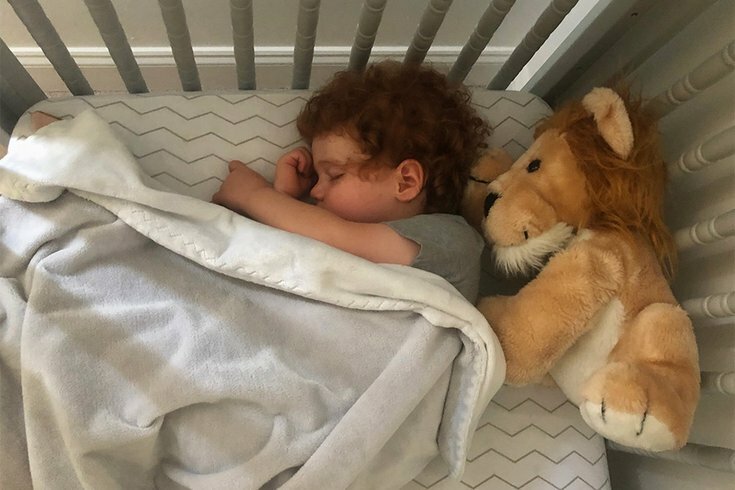 When I am asked by parents whose children are fighting nap time or waking frequently through the night how I got Killian sleep consistently and easily, I share the tactics that have worked for my son. All of our children are beautifully unique, but each child can sleep just as well as mine does. As a first-time Mama, I know I am no expert but I have sought the advice and guidance of those who are, including my parents and Killian’s pediatrician. These resources have helped to guide the sleep strategies for my son that may also work for your children. Newborns require a lot of sleep, about 16 to 18 hours a day. By a month old, Killian was napping frequently throughout the day and sleeping 6 straight hours at night between feedings. I would put him down at 10 p.m. when my husband and I would go to bed, he would wake around 4 a.m. for a feeding and then around 7 a.m. to get up for the day. At two months old I started him on a nap schedule. Every day at 10 a.m. and 2 p.m. he went down in his crib. At first, Killian really protested but I knew he needed to get into a nap routine so I kept at it. After a couple of weeks he grew to expect and understand nap time and no longer cried when I put him down. Frequently he would nod off in my arms or in the car between naps (infants need a ton of sleep!) but his nap schedule and bedtime remained the same. At this age, babies need 14 hours of sleep every day with 8-10 of those sleep hours at night. As Killian transitioned out of the newborn stage, we stuck with the nap schedule: every day at 10 a.m. and 2 p.m. no excuses or exceptions. We were able to get out of the house more to attend activities like story time at the local library and run errands but our day always revolved around his nap schedule. During this age we started gradually moving Killian’s bedtime up from 10 p.m. to 7 p.m., hoping he would sleep longer through the night. He continued to wake once a night to nurse until we followed some great advice from our doctor following his six-month wellness check-up. Babies this age require 14 to 15 hours of sleep a day. At six months old and at the advice of our pediatrician, we stopped rooming-in and moved Killian from next to our bed into his own room and started letting him cry it out to work on getting him to sleep straight through the night. Our doctor explained that Killian no longer needed to eat in the middle of the night and we needed to break him of the habit of waking up to nurse. That first night was rough for all of us. Per our doctor’s orders, every ten minutes while he cried I would go into his room, rub his back to soothe him (without picking him up) and told him that everything was alright, Mama was here but it was time to go to sleep. After an hour or so he would settle down. Following three nights of this, he was sleeping 12 hours straight through the night. It was really hard to listen to him cry and not pick him up to nurse him, but I knew this transition was really important to get through. He continued with two daytime naps at this age. As Killian has become a toddler, his two daytime naps have morphed into one , which usually happens for kids around 18 months. There were a couple of months during this transition when I did not really know if he would nap twice a day or just take one long midday. It is common for toddlers to fluctuate a little before settling into one nap a day so our schedule was really flexible to accommodate his needs. At nearly 22 months old, he now goes down for his nap around noon and sleeps for three hours. His bedtime has been 7 p.m. since he was six months old and he continues to sleep 11 or 12 hours without waking. Consistent routines are vital to your little one’s overall health and wellbeing and are paramount to getting into a good sleep pattern. In addition to setting a schedule for nap and bedtime, since Killian was an infant we have created sleep routines that have now become second nature for my family. Anytime he goes to sleep, we draw the curtains to make his room dark, turn on a nightlight and play soft lullabies. We keep the temperature in his room set to 67 degrees and put him in a few layers to keep him cozy. When he was an infant he wore a long-sleeved onesie with a swaddling blanket and then later a sleep sack on top. As he grew older, Killian transitioned to a short-sleeved onesie plus one cotton pajama topped with a fleece pajama to ensure he did not get cold because he never slept with any loose blankets, which are a major hazard for babies. Once he hit 18 months, we started putting him down with a soft blanket and a couple of his favorite stuffed animals to cuddle. Since he was a newborn, Killian’s bedtime routine has started with dinner at 6 p.m., followed by a bath and story time. After we read books, we turn off the lights, turn on his music and night light, have our final sweet hugs and kisses and put him down in his crib. When we are traveling, we keep these routines consistent which helps him go to sleep in unfamiliar places. … flat on his back and in his own bed! If you always feed or rock your baby to sleep in your arms they will not learn how to fall asleep alone in their beds. This was one of the most important pieces of advice that my mother gave me when Killian was born and something I frequently encourage parents to do. Especially when your baby is an infant you may find it hard to put him down but it is so important to try. I do not recommend bed-sharing because of the elevated risks posed to the baby. While I know many amazing mothers who swear by bed-sharing, it is not a practice I used and the experts agree neither should you. Pediatricians recommend laying your baby down to sleep flat on his back in his crib because it greatly reduces the risk of SIDS. Swaddling is a great technique for adjusting your newborn to sleep outside the womb flat on their back and he will quickly adapt to this position if you are consistent with it. If you have a hard time swaddling, try the Miracle Blanket. Once your baby starts rolling over, usually between four and six months old, swap the swaddling for a sleep sack. Still put them down on their back, but do not worry if they turn over while sleeping. Because of those tummy time exercises they now have the strength to flip over and reposition their heads on their own. 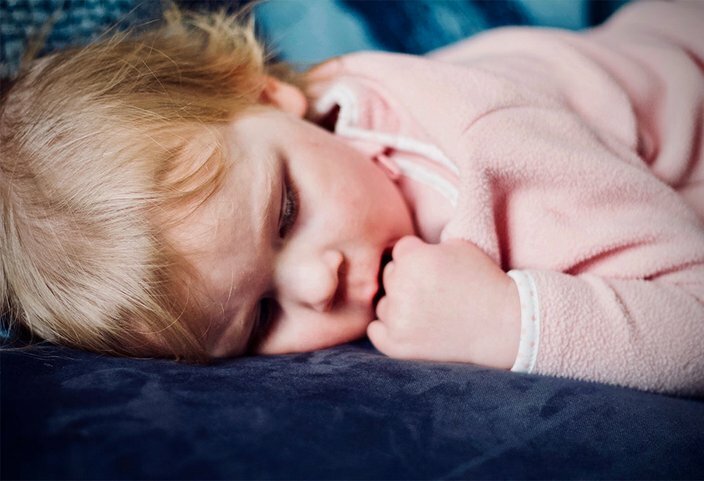 If your baby is the one in 20 diagnosed with severe gastroesophageal reflux diseasex, laying them down on their back may cause him agony so talk to your pediatrician about different treatment options to relieve their symptoms and get them to sleep safely and comfortably. No matter what the age of your children, it is never too late to implement a sleep schedule and consistent routines to help you all get some well-deserved rest. Good luck! What advice do you have for getting your little ones to successfully nap and sleep through the night? Share with me and other parents in the comments section below or Tweet me @ThePhillyVoice and @KathleenEGagnon.